…shared with Fürther Nachrichten her opinion on why women are often considered as the weaker gender in the technical industry although they can be very strong, too. The problem lies in their attitude and their beliefs. A good example is a friend of Herna’s, who rejected an opportunity to take on a leadership role in a company due to familiar and social reasons. It is clear that women often hesitate to take on a leadership role because of how other people might see them. Germany provides an outstanding environment and opportunities for both males and females who want to pursue a technical education. However, many women do not use the opportunities to apply their skills and knowledge to make a career due to perceptions of others. Furthermore, some lack the aspiration to change and improve the world. With her entrepreneurship attitude and approach, Herna Muñoz-Galeano, a native Columbian who has lived in Germany for 30 years, discovered the opportunity of creating an expert system for personalized medicine: a Europe-wide, unique innovation which has been developed to help physicians to adjust their patients’ medication requirements in order to reduce the risk of medical complications and other ailments. The complexity of the project was to process large amounts of data based on the patients’ blood analyses and genetic features. The system is being developed by Herna’s company HMG Systems Engineering. The medium-sized business, which started in 2014 with 14 employees, now consists of 17 women and 17 men from 8 different countries. The employees are experts from the fields of engineering, molecular biology, physics, computer science and economics. The entrepreneur explains that the colorful mix of cultures in HMG Systems Engineering is not a coincidence. What Herna looks for in potential candidates is not only their suitability and ability to work in the team, but also whether they would love their jobs. It is not easy to find male employees who are willing to work under female leadership. There is still much room for improvement when it comes to work –life balance in Germany, especially in terms of childcare versus job. Therefore, at HMG, employees are to break down their tasks into smaller components which they can complete within a week. This allows the employees to manage their own time, which makes them more flexible. 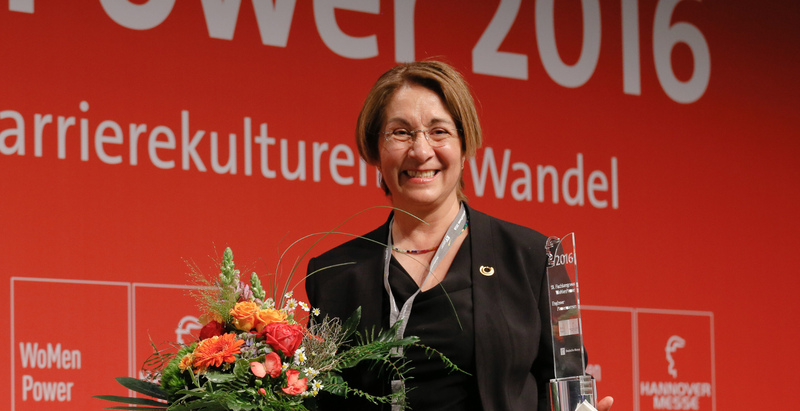 On 29 April 2016, Herna has been awarded the “Engineer PowerWoman 2016” at the Hannover Messe for her special achievements in the MINT (mathematics, informatics, natural science and technology) industry.